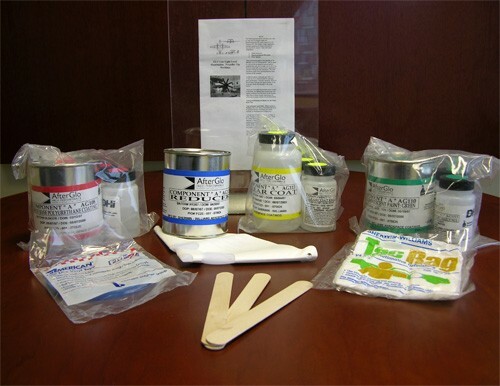 High Performance photoluminescent paint kit. This application is a two-part urethane paint system with all the materials necessary to paint 600 sq-in. A gravity feed HVLP spray gun with a 1.4-1.5 nozzle is recommended. Developed for the U.S. Navy and tested under the harshest of conditions. DHi’s photoluminescent paint application maximizes visibility, material adhesion, durability, wear-resistance and ease of installation without compromising rotor aerodynamic performance. At night, improvised landing zones (be it a vacant lot, road intersection, or some other cleared area) are an immediate attraction to people of all ages. Fire fighters, EMTs and police security personnel often have their hands full and even they can get distracted around the helicopter trying to keep order. People need sensory cues to warn them away from spinning rotor blades. Defense Holdings, Inc. demonstrates its AfterGlo® brand photoluminescent aviation safety paint on a Fairfax County, VA police helicopter.